The official language of SMiRT-15 is English. 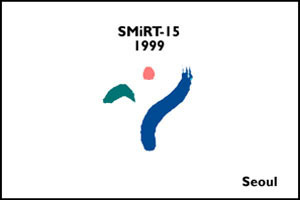 All official presentations and discussions in the technical programs of SMiRT-15 should be made in English. In addition to the opening session and the general session (Division A), thirteen divisions were devoted to paper presentations on specific topics. Opening lectures and plenary lectures were presented in the opening session and in the general session, respectively. Three opening lectures were given in the opening session which was held during 10:00-12:00 on Monday, August 16. Two plenary lectures were presented every day during Tuesday, August 17 – Friday, August 20. Each division consisted of several sessions. Every session wass identified by the session ID given below. Each session lasted 120 minutes, and there were be 6 or 7 oral presentations in each session. A typical presentation was allowed 15 minutes and was followed by a 5 minute discussion. The papers presented in each session are listed in Part II, “Paper Lists of Sessions,” in this booklet together with the meeting room and chairpersons. A presentation identification number (PIN) is assigned to each paper. The PIN appears as AXX/N. The first three characters represent the session where a paper is presented.